Chases Calendar of Events has listed May 3rd as Garden Meditation day. As part of Gifts From The Garden Month, the third day of May has been designated as the time to remember that we don’t have to sit still to meditate. Meditation is about letting everything else go while we focus on just on thing. Our attention might be on our breath, on a mantra we’re repeating out loud or in our minds, or on an action as simple as walking. Meditation can be a matter of focusing on the down-to-earth act of pulling weeds. Planting seeds can be a form of meditation, if we’re willing to release all the thoughts of past gardens and future planning’s, and concentrate on the feel of seeds slipping through our fingers, and into the soil. This all sounds really great, but frankly my mind is cranking at a zillion miles per hour and slowing it down is a major challenge. I’m juggling dozens of balls of responsibility at any one time, not to mention the stuff I’m constantly thinking about that I have no control over at all. I acknowledge my chattering mind and then bring my attention gently back to the garden….sometimes more successfully than others. I’ve decided that my ability to meditate is very much like my garden: sometimes things grow and sometimes they sulk, sometimes the garden is clear and other times it’s choked with weeds. No matter what the state of the garden, we continue to plant and tend. 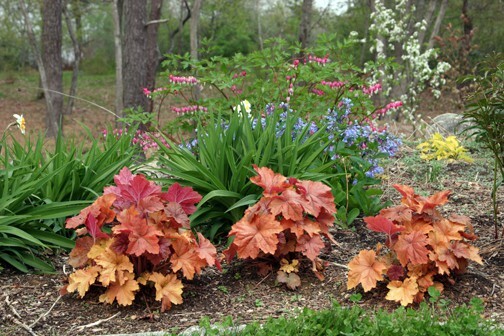 These Southern Comfort Heuchera are lovely, but all around them are weed and feverfew seedlings. My challenge is to focus on pulling weeds, while acknowledging the the beauty around me. To be fully present in the spring garden is a gift.